The interior airplane shots are pretty much splined. I ran into an issue after I remembered I had picked up a shot from Gabe and hadn’t even blocked it yet. It is now splined, however, and ready for some polish. For the shoggoth arm, I spent some time stress testing it, but I didn’t put it in the scene. That should be done by the meeting on Wednesday. 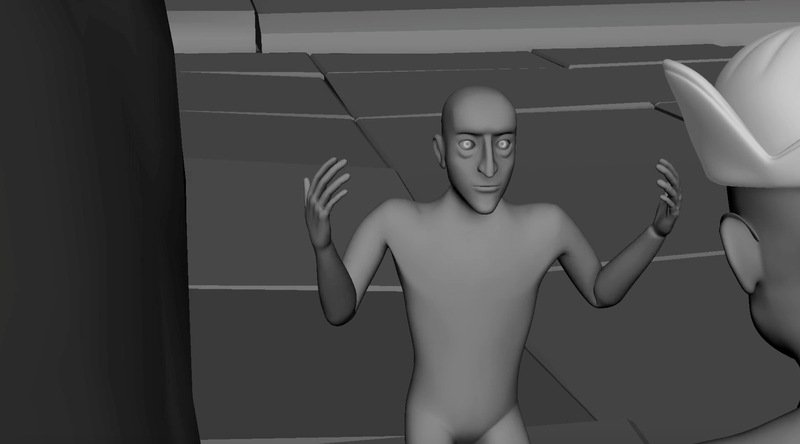 This week was mostly about the animation. I was sadly very busy this week with non-school things, and that slowed me down. I still spent a large chunk of time working on the animation and smoothing out what I already have. I also finished the shoggoth model including UVs and got it on the server. Summary: I put the bottom of the shoggoth on, which included making the mouth, and I also unwrapped it so now it is ready for both textures and UVs. Pros: The model is now ready to be rigged, and Anthony has agreed to take the lead on rigging this monster. Cons: The shoggoth still has a ways to go until he is done. 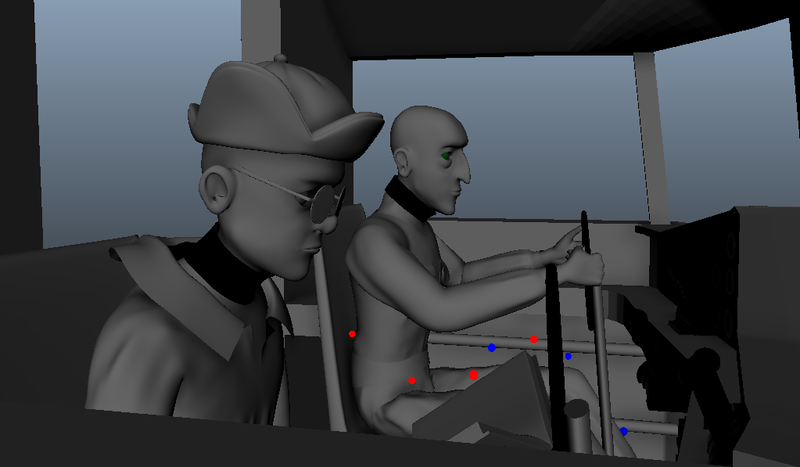 Summary: I was only able to spline out 5 shots this week, and I didn’t get to faces. I should still be able to get what’s expected done on time though, and I’m confident that the quality will be high enough for first pass renders. Pros: Several shots are ready for faces, and the ones that are left to spline have very little in the way of acting in them. Cons: There are still several shots that I need to get into, and I haven’t even started with faces yet. This week, was a week of gathering and planning. We went over multiple changes to our animatic and got everything organized so things should go more smoothly in the future. Summary: We got together and talked about some changes to the animatic and some camera movements. We also met on a different day and recorded some new reference to fill in the gaps of what we already had. Pros: We now are happy with the tent scene and the reference we have. 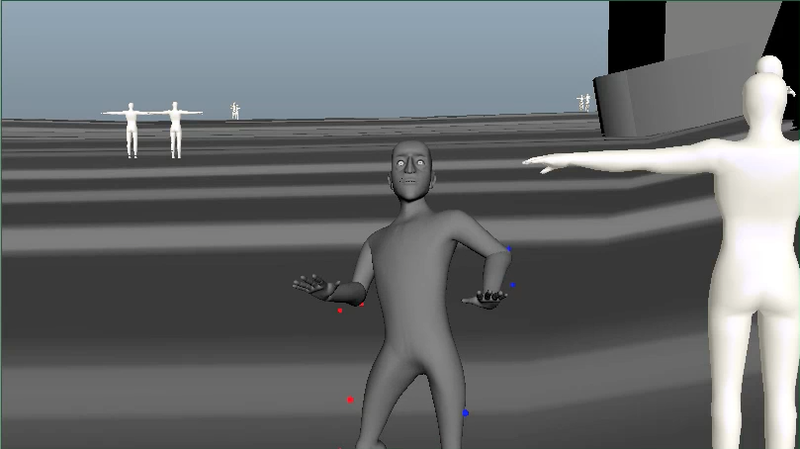 Cons: This took away from the time that could have been spent working on the animation. Summary: I have replayblasted all my shots so now they fit cohesively in the animatic. I also trimmed all the reference so it will play well with my shots. I had an odd issue with one of the environments in that the floor was all messed up upon import, so I had to address that, which caused me to lose several hours. I also got the reference for some shots I had been missing and I blocked in the basics of those shots. Pros: I am starting to spline some shots into a more smoothed look. Cons: The floor of the tower caused me to lose a chunk of time, and a large portion of the last few days was just setting the scenes up to playblast well. Break Summary: Over break I went back and gave a second layer of polish to most of my assigned shots. We now have our final dialogue, so I grabbed the audio clips and adjusted the shots with temporary dialogue to match the new ones. This week, I spent some more time working on some animations. 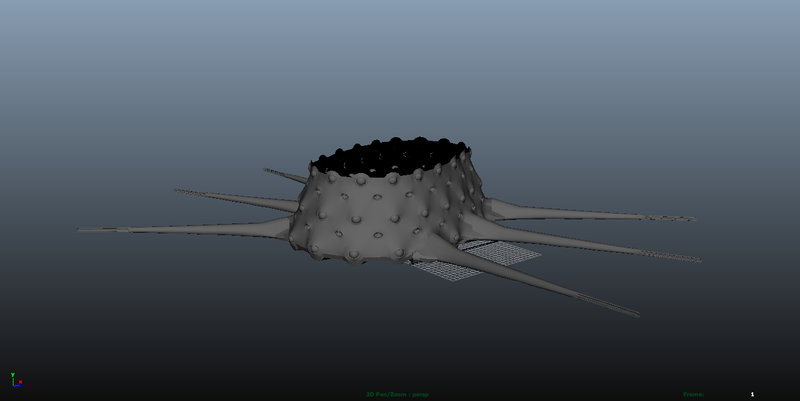 I also worked on setting up the base mesh for the shoggoth, which is still ongoing. As a group, we have decided to pay the most attention to the interior tower ending sequence for this month, so this section has received the brunt of my attention this week. Summary: The top of the shoggoth is now closed in a way that I think will work well with the rig. It still needs some smoothing, but other than that, all I need to do is close the bottom and then I can start rigging it. Pros: The model is still coming along well, and it’s now closed up. Cons: The bottom still needs to be closed, and I am unsure of how the model will react to the rig. Also, the shoggoth looks like it has a really dweeby haircut right now. Summary: I have gone and retimed and refined all the interior of the tower shots so now they work with the current audio. I also redid the base posing in two shots because I felt that the action wasn’t reading well. 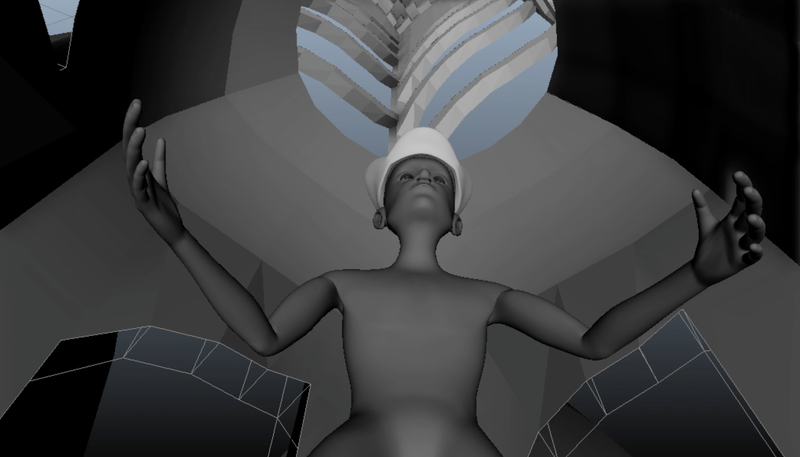 Pros: I feel as the interior tower shots are ready to go into rough animation state out of the pop through. Cons: The amount of work coming this way is impressive, and it will take some strong dedication to stay on track. This week, I spent some more time working on some animations. I also worked on setting up the base mesh for the shoggoth, which is progressing nicely. Unfortunately, I have been having some crippling computer issues, and that has slowed me down. Pros: The model is coming together exactly how I pictured it, and I feel that it will fit our needs well. Cons: As it is now, the poly count is very high, and it will be pretty dull and repetitive to have to rig all the eyes and mouths. Summary: More blocking has been done, but again, I wasn’t able to do as much as I wanted, as my computer has been having issues and I have been slowed down due to that. Pros: Progress is still being made, and I worked in an extra few days into my schedule when I planned it to account for this exact thing happening. Cons: Again, my work has been slowed down, but I feel as though I’ll be able to keep the original pace yet.